About my libraryI started buying Dell Yearling Books back in grade school, and in middle school I started collecting old children's books. The four summers I worked as a bookseller added greatly to my library. Now I have books piled throughout my house. 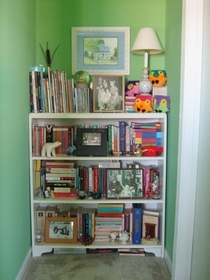 The picture above shows my paperback selves with just some of my treasures. 5 Stars = I absolutely loved it! 4 Stars = I loved it! 3 Stars = I liked it! 2 Stars = It was okay. 1 Star = I didn't like it. I usually try to read library books and then buy the paperback if it fits into one of the above categories.